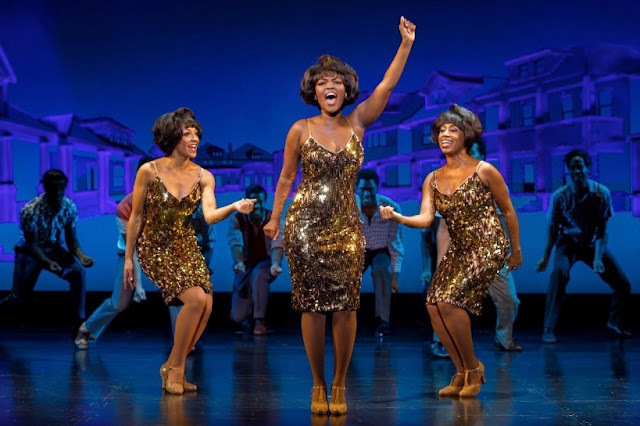 Carol's Theatre Reviews ~ It's Fun To Go Out: “Motown The Musical” Returns to Enthusiastic San Diego Crowds. “Motown The Musical” Returns to Enthusiastic San Diego Crowds. 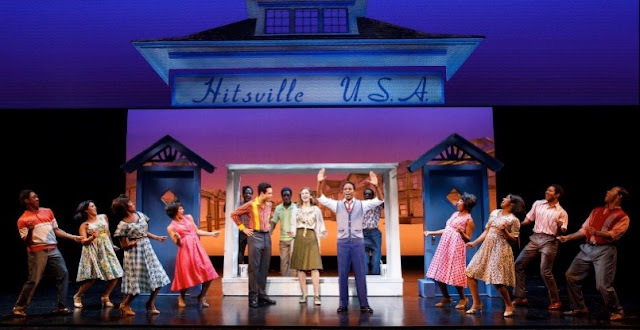 It wasn’t that long ago that “Motown The Musical”, the Jukebox musical, made its National tour on stage at the Civic Theatre. It’s back again for a short run through Dec. 31st and well worth seeing, even for a second look. With book by Berry Gordy and music and lyrics taken straight from ‘The Legendary Motown Catalog” (there are about 50 in the show) and based on Gordy’s book, “The Book To Be loved: The Music, The Magic, The Memories of Motown”, the musical stays true the times as well as the rise of the Motown label not to mention the incredible story of Berry Gordy who is played by the talented and versatile Kenneth Mosley. Unfortunately the book, which as a memoir and reads like a diary doesn’t leave much to the imagination fencing Mosley in to do the best he can to bring us Gordy’s story beginning in 1983 when Gordy is invited to attend a reunion at the Pasadena Auditorium that will bring together most of his famous stars. Gordy has been burnt by most of them and refuses to attend. Kenneth Mosley and cast of "Motown The Musical"
It then segues back in time to the Joe Lewis -Max Schmeling match that Louis won. In the beginning he wanted to become the next Joe Louis. When he gives up that dream he manages to talk his parents back in their Detroit home, into a loan to start up his recording company, Hitsville, USA. From there the show takes off with one new up-and-comer after another followed by one recognizable tune after another, some in part and others in large production numbers. Add to that the period costumes that reflect the span of the musical (Emilio Sosa), throughout the 60’s and into the 70’s’ are a reminder not to throw anything away. Outstanding projections (Daniel Brodie) showing actual historical footage of events that coincided with the rise of R&B like the assassination of President Kennedy, Martin Luther King and Bobby Kennedy. They brought memories of painful days. 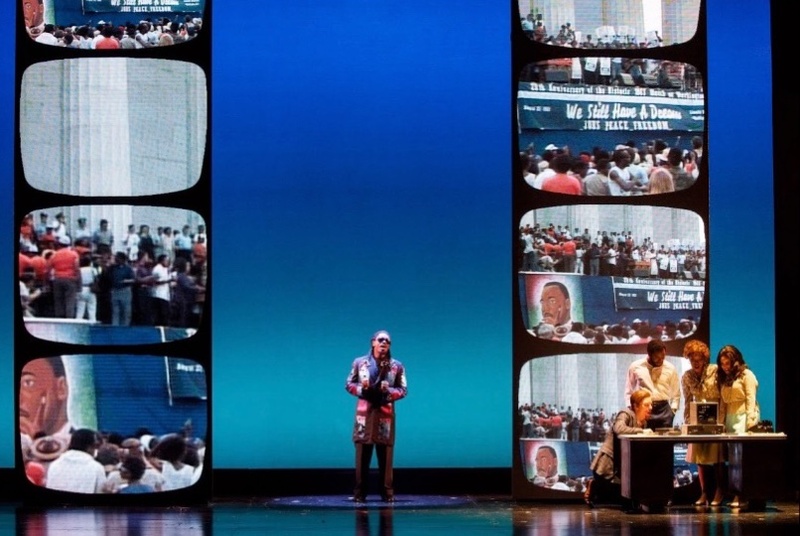 The times were also a constant reminder once again of the stain on our history as segregation reared its ugly head before, during and after Martin Luther King’s “I Had A Dream” speech, that prevented Black artists the same recognition as whites. Some things have changed for the better, others not so much. An all-star cast with the dynamic 7th grader Kai Calhoun as the younger Michael Jackson brought the audience to its collective feet when he first came on stage to shows end and the love story betwen Dianna Ross and Gordy (with oodles of chemestry) plays out to its predictable ending; he being a control freak and she taking a contract with RCA for more control over her shows and more money than Motown Records was worth at the time. 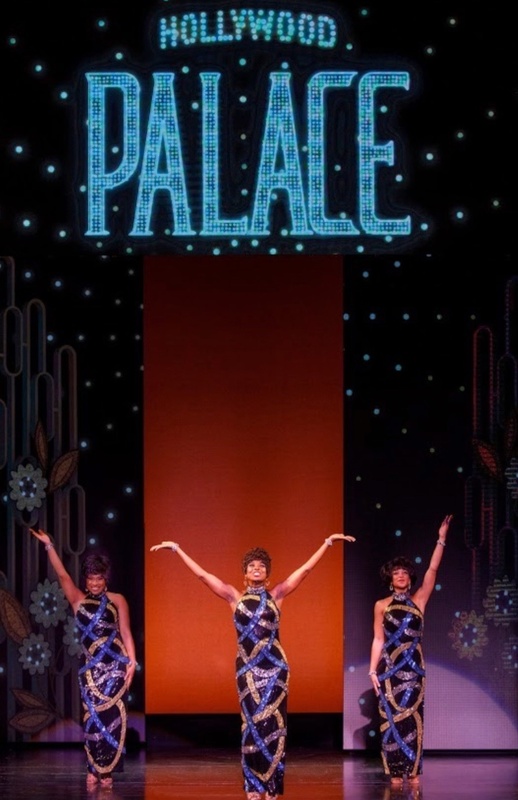 Brazen and eye popping scenic designs (David Korins), lit with more eye popping flashes of colors by Natasha Katz, an endless supply of dancing, with Patricia Wilcox and Warren Adams, choreographing, that went on throughout the curtain call. An all-star cast with Charles Randolph-Wright directing brings home the bacon. The list of now famous R&B stars reads like the Whose Who in the Motown Hall of Fame, names Berry put on the map. They include of course Dianna Ross (a spunky and personable and talented Trenyce) “Reach Out And Touch, and The Supremes, The Marvelette’s (“Please Mr. Postman”), Marvin Gaye (a sturdy and strong voiced Matt Manuel) and Stevie Wonder (Cartreze Tucker), The Jackson Five, Gladys Night, Rick James (Erick Patrick), Smokey Robinson (an amazing Justin Reynolds), The Temptations and the list goes on with almost all of singer/actors stepping into many roles over the course of the two plus hour show. But it’s the music that has everyone lip-syncing: “Where Did Our Love Go”, “I Hear A Symphony”, “Ain’t No Mountain High Enough”, “I Heard It Through The Grapevine”, “I’ll Be There”, “Mercy, Mercy” Me”, “Please Mr. Postman”, “Stop In The Name Of Love”, “ My Girl”, My Guy”. 59 (by my count) and it was about as stimulating and entertaining as one would wish for a night out on the (mo) town. 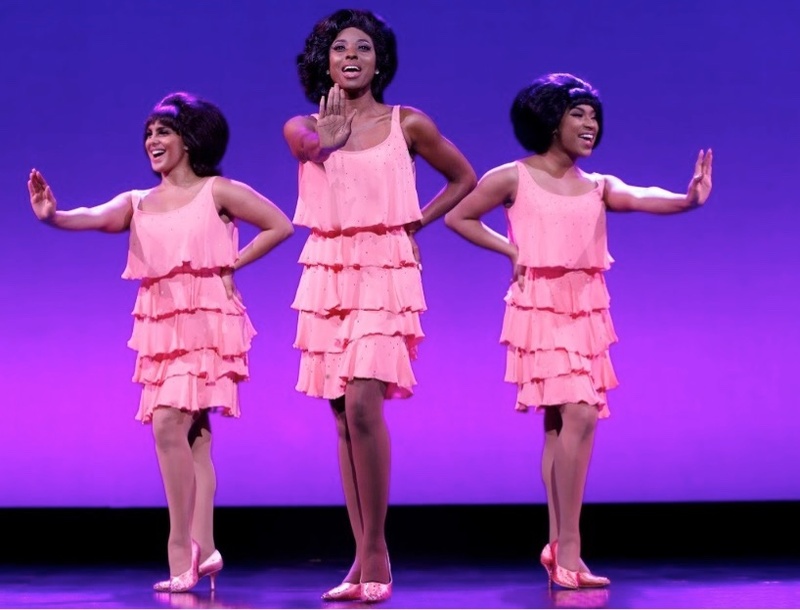 Motown premiered on Broadway in 2013 and ran for 738 regular performances. Those familiar with Motown and the music it generated will be more than pleased with the music and the performances and will most likely overlook the choppy narrative and the abbreviated tunes. It’s lively and a piece of musical history worth remembering.